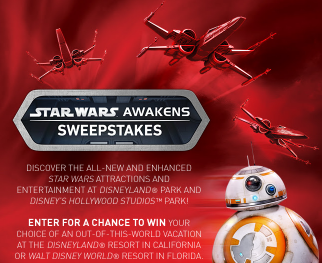 Disney Star Wars Awakens Sweepstakes – Win a trip to Walt Disney World or Disneyland! Win a trip to Walt Disney World or Disneyland! ENTRY LIMIT – Entries are limited to one (1) Entry per Member for each day during the Entry Period, whether a Member has more than one (1) Address or more than one (1) person uses the same Address. ELIGIBILITY – Open only to persons, who are, 18 years of age or older (or who have reached the age of majority in his/her primary state/province of residence, whichever is older), and who are legal residents of, and physically located within, the 50 United States, D.C. or Canada (excluding Quebec). SWEEPSTAKES ENTRY PERIOD – You may enter this Sweepstakes via the internet during the period beginning at 9:00 AM, January 21, 2016 and ending at 11:59 PM, February 18, 2016.
selection and date of experience is at the discretion of Sponsor; based on availability; restrictions apply). Approximate Retail Value (“ARV”): US$8,739.56, which will vary depending upon point of departure and seasonal fluctuation of hotel rates and airfares.